One of the most common types of aji (chili) in Peru, aji panca is 3 to 5 inches in length and has a thick flesh that matures from a green to dark red in color. 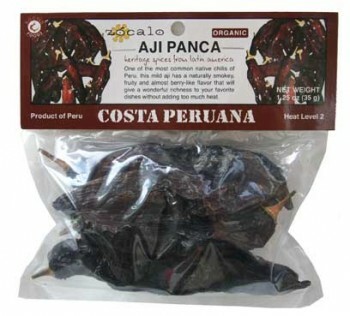 Distinct from the other ajis in its spiciness, aji panca is mild in heat intensity (a heat level of 2 on a scale of 10; 1,500 Scoville units) and provides a fruity, berry-like flavor that goes well in stews, sauces, and fish dishes. 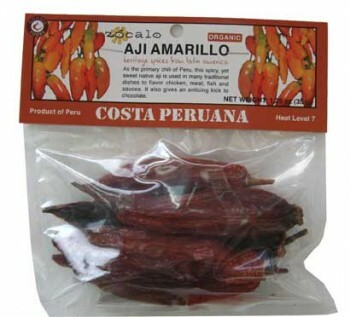 Aji panca adds a sweet, mild heat. 100% USDA Organic Chili Paste. No artifical colors or flavors. This mild chili paste is often used in stews and fish dishes. Combined with sauteed onions, garlic, and herbs, it is an excellent base for many dishes. The fruity characteristics and mild heat also work great with chocolate, whether incorporated into a chocolate sauce or baked into a cake or cookies, it will add that extra dimension and "WOW" factor! Temper the heat in the Michelada: Aji Limo Spiced Beer Cocktail by substituting the Panca Paste. Ingredients: 100% Organic Panca chili, water, citric acid. 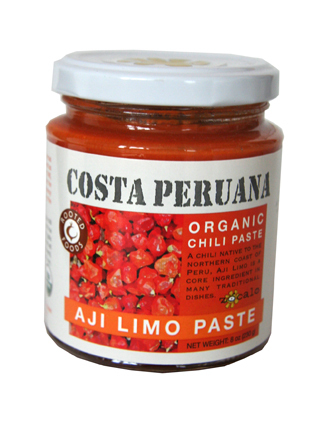 Aji Limo is a chili grown and used mostly on the northern coast of Peru. The pod is 2-3 inches long and changes from a yellow to deep reddish-orange color when it ripens. Aji Limo is spicy (a heat level of 8 on a scale of 10; 60,000 Scoville units) and is primarily used to prepare ceviche and rice dishes. It is also wonderful as a base for chicken and pasta recipes. This product contains no dairy, soy, refined sugar, preservatives, additives, trans-fat or genetically modified ingredients (GMOs). Marinate your fish, chicken or pork before cooking. Ingredients: Organic Limo chili, water, citric acid. Aji panca is so sweet, so berry-like, that it can be finely chopped or ground into a powder and tossed into foods to add a sweet, mild heat. Try them in this Ceviche Con Tostones Recipe! Mix it with lime juice and whisk to drizzle over freshly sliced avocado for an afternoon snack or nice appetizer! Make a paste and marinate your fish, chicken or pork before cooking. To create a paste, remove the stems and soak ajis in water overnight. Drain and mix ajis in a blender with salt, pepper, garlic and extra virgin olive oil. For a more mild paste, remove the seeds and veins before blending. You can freeze the paste for longer storage as necessary. 100% USDA Organic Chili Pods. 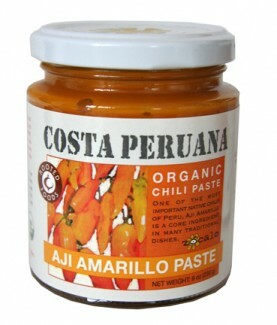 Aji amarillo, or amarillo chili, is the most common type of aji and is one of the most important ingredients in Peruvian cooking. It has a heat level of 7 on a scale of 10 (50,000 Scoville units). It is great in combination with meat, poultry, fish, vegetables, pasta, and rice dishes, and is used to season nuts. The unique flavor of the Aji Amarillo makes it worth seeking out and incorporating into your cooking. Even though it is a "chili pepper" it has a lot of fruitiness combined with its heat, unlike poblanos or jalapenos which can be harsh. It is a very versatile chili, suitable for everyday use as it will complement your dish without overwhelming it. 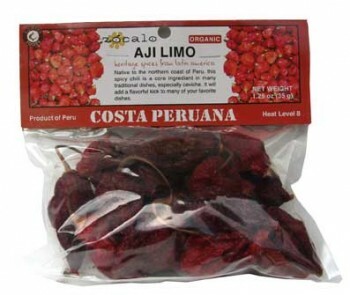 Aji Limo is a chili grown and used mostly on the northern coast of Peru. The pod is 2-3 inches long and changes from a yellow to deep reddish-orange color when it ripens. Aji Limo is spicy (a heat level of 8 on a scale of 10; 60,000 Scoville units) and is primarily used to prepare ceviche and rice dishes. It is also wonderful as a base for chicken and pasta recipes, and a perfect way to add an extra flavor dimension to stew and chili.